I am continually amazed by how capable babies are. Sometimes words, however descriptive (even mine! ), can’t do them justice. So, I’ve attached a video from one of my classes to this post to visually demonstrate. Please have a look (no actors were hired). I was stunned to learn years ago that once a baby is able to sit securely on her own (usually 8 to 12 months old), she can actually sit down to eat at her own little table. High chairs are certainly functional and have been around for hundreds of years, but believe it or not, it is easier to feed a baby at a small table. And babies love the independence — their feet touch the floor, they can sit while hungry, and leave the table as soon as they are done. Ditching the highchair may sound like an overwhelming prospect, and I am not suggesting parents dump it entirely. But I do recommend giving the small table a try, first only for snack time. Then, if the baby does not play by the rules, you can revert to the high chair and know he has not missed a whole meal. Eventually, you may see the benefit of using a baby-size table for all his meals. 1) The baby must sit while eating. This is a wonderful first limit for babies, and they will enjoy testing it…and testing it…and testing it. (Please see video.) But they do get the concept almost immediately. 2) If the baby leaves the table, he is signaling that he is finished, and we put the food away. This may take a few tries to sink in, and we give the babies several chances at this when we introduce snacks in the RIE parenting classes. But parents should adhere to this rule right away at home to make it as clear as possible. It is helpful to give a warning, “Next time you leave the table I will put the food away,” and then follow through. This is not cruel or abusive! Children quickly learn they have a choice, and when they are truly hungry they stay. 3) Food is simply offered. A baby is never forced or coaxed to eat (“here comes the airplane…”) Babies do not have to even come to the table if they are not hungry, or if the food is not ready yet. Compare this to the highchair experience, where a baby is strapped in while waiting for his food, and then often signals he is finished by dropping food on the floor or throwing it. When babies eat at small tables they seldom, if ever, throw food. Children benefit in many ways with this approach to eating. They are invited to be active participants in mealtime, instead of a captive audience. They are allowed to decide how much they will eat, and how long they will spend at the table, which gives them the small sense of control that burgeoning toddlers crave. Mealtime is more pleasure and less chore for parents too. Participation in a predictable ritual brings a sense of security. The baby anticipates and relishes in each step: wiping his hands with a wet washcloth, choosing a bib, practicing with a spoon, and wiping off the table afterwards. Parents are teaching good manners, safety, and focus. A toddler who sits to eat is less likely to choke than one who is followed around with snacks while he plays at the park. And he is learning to do one thing at a time. He focuses on the food and the company he’s with until he is finished eating. In the parent/infant classes we begin with bananas, and the babies help peel them. When the children are a few months older we offer small glasses (yes, glasses), although plastic works fine, too, and water. The key is to put just a sip’s worth of water in the glass, so it doesn’t matter if they spill it while they are learning. Sippy Cups can be skipped altogether. Eventually, the children pour the water themselves using small pitchers or measuring cups. Needless to say, they really get into the pouring part. Most of us would not think an 18 month-old capable of pouring water into his glass. But with practice, a toddler learns this skill quickly and takes great pride in his accomplishments. Every parent would adopt this approach to feeding a baby if they knew how much easier, safer and more enjoyable mealtime could become. Do try this at home. I didn’t do any of that, but in hindsight I wish perhaps I did. It sounds like all the favorable traits connected to meal times are wrapped up neatly into a whole new approach as compared to what we were used to. I’m going to send this to friends with toddlers, I think it is excellent advice. Thanks Janet. Thanks Ed! As I look at this video with a critical eye I realize that I need to remember to speak more slowly to the children. I also wish I would have acknowledged the phone call interruption a bit more, instead of trying to move on while the children were obviously distracted. Hmmmm. I would love to try this but I can’t find and watch the video. I don’t know where to start. My baby girl is 20 months and is used to throwing her bowl off of her high chair, even before she has started eating. I just put the food directly on the tray to avoid food on the floor. I would love if you could tell me the link to watch this video. You will be amazed at how easy it is for toddlers like your daughter to sit at her own little table on floor, or on a small, safe chair or stool. Try it for snacks first so that you don’t have to worry about her not eating enough. Most children love the ritual of eating this way, and they definitely appreciate the autonomy. Hi, I just came across your wonderful blog. May I ask where you can purchase one of those tables? Thank you. Thanks! Here’s the website for the RIE furniture: http://www.radomir.org/Childrens_furniture/RIE_Furniture.html Another company also makes the tables: Bueno Baby. 310.392.2462. In the meantime, if it’s for just one child we’ve used rectangular topped footstools, or bed trays with legs. (I believe they still carry them at Bed, Bath and Beyond.) Good luck, and please keep me posted. I am a huge fan of your website and I read it regularly. Keep up the excellent work! I am a big fan of Magda Gerber’s books, but it had never occurred to me this feeding idea. When I saw your post I told my husband about it and he made a table for our baby. The three of us are so happy with it. I love the way she just crawls away when she is finished. Thanks so much for the wonderful tip and for all the other great posts. Thanks so much for sharing your success with the baby-sized table. Your daughter will continue to be fond of her table and appreciate the trust you have in her to eat only as much as she wants. You and your handy husband made my day! Janet, I love this, and in the past week, I’ve tried this with snacks, and its fun and so great! I would love to see this in action with a meal. I’m so nervous to do this. I have only attempted to feed meals in high chair, or with my son sitting on my lap. Especially, I would like to see, how to keep them from running away with greasy hands. At home would you feed them their dinner this way, in their play area, or another designated area? And I notice some babies open their mouths for the food and others reach out. Is there any difference, what should be happening at home? The babies were opening their mouths that day for some reason, so I followed their lead. Usually, I offer a piece of banana and the child takes it in his hand. At home, you could have a small plate on the table with a few choices of foods and allow your son to take what he wants or ask if he wants you to feed him… It really doesn’t matter because he’ll want to pick up the food eventually, if you don’t make a big deal out of it. Very interesting approach! One question, how would you recommend incorporating the whole family into the babies meal time. For instance once the baby has this concept down would the family sit and eat at the baby’s table or would you position the baby’s table near the family dining area. More curious how to make this a family experience without making the child feel removed. This is a really good question. The infant/ toddler table is probably more geared more towards babies eating breakfast and lunch, or dinner at an earlier time than the rest of the family. It’s also centered around the idea that adults and older children usually want to stay longer at the table dining than a baby does, and that the baby needs more one-on-one attention. But, certainly, others could join you at the baby’s table (my children loved doing that). Or, maybe one of you could sit at the baby’s table close to the family dining area. We usually had a safe booster or highchair on hand for the baby to sit at the table for special family gatherings. True, Rick. It’s amazing how extremely capable children can be when we believe in them. Also, I see now, when he is able to sit at a table his own size with an actual plate and cup, he carries himself with a bit more poise and dignity. It’s like he feels important and extra special (and he is a confident kid, as it is). Not in an indulgent way, but I guess in a proud way. Interesting, Dena, but it makes sense. Babies develop motor skills so rapidly in the first two years and the highchair can feel very restrictive. I have also noticed the poise and dignity you describe, even with the children who only eat that way in the class. It’s extremely confidence building for toddlers to do things themselves, make choices (like, “am I going to sit and eat or not?”). Thank you for sharing these tips! This is also nearly identical to the way infant feeding is done in Montessori 🙂 Following our daughter’s cues at mealtimes has made my husband and I feel very successful as new parents! This was interesting, Janet. From the video, I could not see the table as serving any function – since you handed the food to the children or put it directly into their mouth. I was wondering why – didn’t you place the food on the table for them to grasp? I’ll agree that highchairs can be misused to ‘trap’ a baby – but safely and in sight of a mom cooking – well – I think if it works for mom – why not? Mom can offer food in the same way you did while the child is in a highchair. The arrangement shown in the video serves to give the child a choice to wander away and learn meaning of ‘sit down’ – if you want food. Useful enough. I’ll give my thumbs-up for using this method with snacks. However, as soon as a baby is crawling, I firmly believe in having a raised surface to sit on – a short stool or chair. The only part of a baby’s foot ‘feeling the floor’ in long sitting is his heel. He needs a chair to ‘feel’ the floor through his feet. Thought-provoking and a good lesson for parents in how early a child can understand directives. Hi Barbara! Usually I offer a piece of the banana to a baby and he/she takes it from me with his hand, but I follow the child’s request when he indicates wanting it directly in the mouth. (They were all doing that on that day, for some reason…imitating each other, perhaps.) After beginning with just bananas and getting the babies used to that, we offer water in cups or glasses. And then we definitely need the table. At home, parents will serve a plate of food at the small table for snacks or meals. I agree! Eating this way is a personal choice, but it definitely allows a child to participate more actively and autonomously. For example, if a baby drops a piece of food on the floor accidentally (or not), he can reach down to pick it up himself rather than crying for the parent to do it. The child gains confidence by being trusted to choose to sit and eat for as long as he wishes, and then choosing to end the meal by leaving the table. Try this sometime! When the child gets used to the routine, you will see very plainly the pride he exudes at mealtime! And we believe it far safer to wait until a child can climb onto a stool or chair himself before placing him on one. The child who can climb on himself, can get down safely. As always, thanks for your thought provoking comment. For me this raises questions around our practice that I’d pondered over a few years ago and then abandoned because it seemed too difficult to tackle. As soon as toddlers have the necessary balancing skills they sit at a low table and chairs. This works very much the way your eating time does. When children are ready to leave we help them wipe their faces and hands and off they go. However, our younger children (up to about 1 year) remain in highchairs. I would love to give them more freedom to come and go as they are ready but had never thought to use the floor. I am now trying to wrap my head around this again so thanks for challenging me! When you say skip Sippy cups altogether….I started placing a sippy cup on the high chair tray as soon as we started solids, and my son was off the bottle by nine months. At what point can I start to just give a cup? You say “a few months” but whenever I have tried to offer my son an open cup he looks at me like I’m crazy. He’s eleven months now, and oddly, drinks out of an open cup in the bath and pool, but for whatever reason I can’t get him to associate drinking at the high chair with open cups. He will drink out of an open cup if I hold it for him. I guess I will just keep trying, offering the open cup first and then offering the sippy for him to finish his milk. Sounds good, Laura. When I mention starting the cup at a few months, I mean with guidance. He’ll need you hold it for him at first. And it makes sense that he finds it strange if he hasn’t been used to drinking that way (for real, instead of just for play in his bath). It a totally different way of drinking than “pulling” through a sippy cup. When you do give him opportunities to try it on his own, give just a tiny amount of water in the cup, so that it’s no problem if he spills. I would very much like to try this. I am sick of the in-and-out and up-and-down of high chairs. I am worried, however, about my little adventurers climbing (and jumping off) the low table when it is not in use. Also, as far as them staying seated to eat, what to do if they take the food and run? It seems like it could be hard to grab and hold a struggling toddler across the table. A couple of thoughts… First, if you’re worried about climbing and jumping, I’d put the table away and just take it out for meals and snacks. Second, this does not work if you allow children to leave the table with food. Calmly and confidently let them know (and follow through by holding their hands or removing the food from them) that the food has to stay at the table. Tell them they must stay until they finish the bite of food, but then they are welcome to leave… If they do start to leave after a bite, ask, “Are you all done? Okay, I’ll put this away.” Often they’ll come rushing back. Toddlers need and want us to be very clear…and they’ll keep testing until we are. Thanks very much for your advice here. I just started trying this with my 10 month old son, but is this too early an age (not considered a toddler yet)? He did pick up the food and start to walk away, so I took the food back. Admittedly, at times it became a bit of a wrestle and he of course became upset. Do you allow him to walk with food or a bottle at other times? That would definitely make this confusing for him. I recommend keeping the “sitting and eating” rule very consistent and something he does with your (or your husband’s) full attention. You could also have him sitting right next to you rather than across a table. Then, think about it…why would he want to leave you and run away with food? The only reason would be that he’s asking you to be clearer and more consistent about your expectations. Ah, thanks very much for your advice, Janet, I appreciate it! rmiller.217: as long as the table is sufficiently low enough like this small one Janet has, a child climbing on it should be able to survive a short jump. The general philosophy of RIE tends to raise toddlers who rarely do things they aren’t ready for yet, or they do it in a way that is safe enough for their abilities. If they’re ready for practicing jumping, let them give it a try. A spill is highly unlikely to do lasting damage, and it may deter them next time they climb up. I’ve noticed that if my son does something sort of risky, that he is not ready for, its usually only once and he realizes how dangerous it feels and just doesn’t attempt it again. Like climbing up something really high. He’ll do it and get back down and be like “whew” gonna do something else. If he is confident and masterful at the action, he does it plenty until he is just tired of it. My son will stand on tables very happily and he really enjoys just standing there up on a high surface, but at 16mo he is not ready to jump off anything, and he never has tried. If he wants to get down, he sits and scoots off. 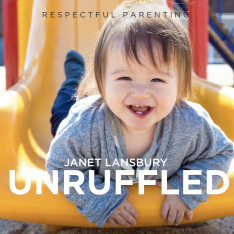 I would continue reading Janet’s articles about why babies need to be trusted to move, and make mistakes, learn to fall, etc, so they may gain experience for self-regulation and awareness. Candace, thanks for this perfect explanation! Awesome video! I love the chance to see RIE in action 🙂 I’ll be getting a small table for my boy ASAP! Thank you for this Janet! I did this in my classroom and it made meal time so joyful. My boys ( for I only have boys in my class) enjoyed setting up the table from a very young age, around 12 months, and now as they are nearing 2 years we have built upon our table manners and added in many nuances to make the experience special for us: making tea, passing out dishes to peers, serving family style (everyone scooping their own, including a limit of 1 scoop). I also follow baby led weaning, or serving children whole foods vs. purees and I believe that this goes hand in hand with building table manners this way. It supports that same respect allowing a child to grasp their food when they are ready, eat as much as they want while experiencing foods in their true form and texture, and build upon skills at their own speed. I am a little bit torn on this subject. I really want the family experience as many meals together as possible. In my understanding that would make a highchair a necessity. On the other hand, I really like the idea of independent eating, that they can leave the table as soon as they are done and that they are learning, that food is only offered and consumed in a sitting position. I was planing to use a small table and chair for arts and crafts and that they would eat at the family table. Do you have any suggestions how we could combine both worlds (independent eating together with the family and not feeling excluded)? Hi Janet- thank you for posting this video. I was wondering why you are the one deciding when the child should get another piece of banana rather than putting a plate with a few pieces in front of him and letting him set the pace? I like to give my kids that independence. They usually know when to reach and grab another piece. Thanks! Stephanie, that would certainly be fine, too, and definitely the way I would present a meal as opposed to a snack. But allowing the child to ask for more insures that each gets my individual attention. It also prevents the child from eating more than she wants (so as not to “turn down” food), AND it makes it easier for the (children who might not practice this at home) not to leave the table with the bananas. Janet, do you have a specific table you reccomend for this type of meal experience? My daughter is 17 months old. Thanks much! My daughter can eat quite independently by hand and is even trying a spoon. She is near,y one. At her childcare which follows a RIE Philosophy which I love she is lap fed as she is yet to be able to get in a sitting position byherself. So my question is isn’t this inhibiting her independence? This seems so logical! I wanted a highchair that slotted right up to our table so he could join us, on the surface we eat from. 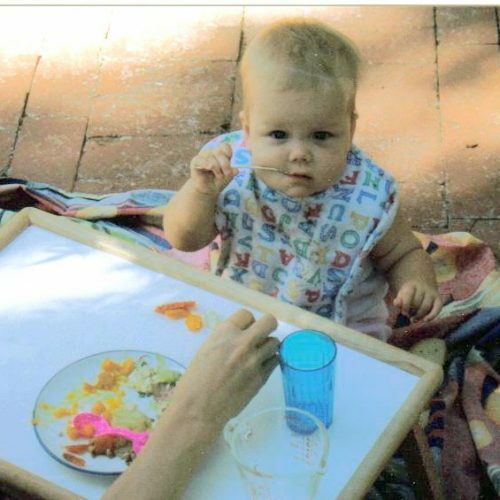 But he could not make a mess (shape of our table meant food hardly ever made it to his mouth when he attempted to self fed – so we got a standard highchair. However for all his snacks and lunch we eat on the kitchen floor. This has always been a fun time for both of us.. so perhaps adding a wee table there for him would be good too! Looking forward to trying it out… thanks! I would like to implement the pouring activity in my class of 2 year olds. We use plastic cups and when I started teaching, I loved the idea of the children pouring but found it difficult to implement with 10 kids. What are your thoughts? Andrea – do you mean you have a 1:10 adult/child ratio? I have practiced this with up to 7 children 2 and under, but 10 seems difficult to impossible. Can you offer two separate snack periods? 2:10 but we all sit at the same time for “lunch.” Could you give some pointers for initiating pouring by the children? Some might be almost 2 or very newly 2, some might be as old as 2 1/2. Thank you so much! This is really interesting. However, do you have any suggestions for incorporating this at dinner time? We use this time to eat with our 9 month old and like to have her with us at the ‘big table’. Initially she ate on our lap but now appears to enjoy her independence in a high chair at our level. While she can’t leave when she is ready, she indicates that she is finished by clapping. 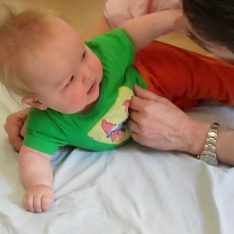 I am really enjoying your blog, and attend babyfocus classes here in New Zealand which draw on RIE and Dr Emmi Pikler’s approach (http://penniebrownlee.weebly.com/dance-with-me-in-the-heart-courses.html). We also make baby tables by just sawing the legs shorter on child sized tables or end tables from garage sales. 15 minutes and a hand saw. My 12yo still uses a baby table in his room to sit on the floor and play legos at and my 3yo does puzzles and colors at hers, no chair necessary. I’ve enjoyed your posts. The one thing with this post that I can’t get past is that you were feeding two children by mouth where your hand is incontact with their mouth and also handling the food that is given to the other children. This may not be an issue in a family setting but in a child care setting it seems very unsanitary to me. I realize this wasn’t the focus of the post but it is what stood out to me. Our 7 month old has just started having a real interest in food. He is currently in a highchair that sits in a chair at the table. I love the idea of him having his own table and being in charge of his own eating… But, I’m curious as to how meals would work for the family as a whole. We love eating our meals as a family at the table. Also, I think that I would want him to stay at the table (when he gets old enough) for the entire meal/conversation instead of leaving as soon as he is finished. How do you transition from the individual table on the floor to sitting at the table with the family? 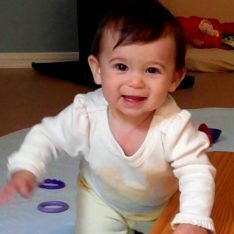 I really need help with my 17month old. From what I understand, RIE doesn’t suggest sitting up a child before he’s developmentally ready, so why do make a child practice pouring water if he isn’t yet capable of doing it? Wouldn’t it be more RIE to wait until they have better dexterity? Also, due to my house set up and finances I am not able to do anything else by the high chair I already own. How can meal times be more respectful of my child if shes strapped to this chair? Thanks, Janet! Hi Steph! RIE does not suggest “making” a child do anything. Toddlers can’t WAIT to try pouring! Most have been doing it in the bath. It’s literally their favorite part of snacktime. As for being respectful of a child in a highchair…. I would not leave your child there while you prepare food or go to get more, etc. Have everything prepared before asking your child to sit. Then, sit with her and pay full attention, releasing her as soon as she’s done. Janet, so true! Babies do not throw food when at the table. They do adjust by the adult being consistent, and from my experience, the baby likes the new experience of being at the table. I love this post and happy to see the guidelines for others to easily follow. Thanks so much! Hi Janet! I have recently discovered RIE and find our blog so helpful. Thank you for all you do. I have a question about younger children. I have 6 month old twins and am planning to start solids in the next couple of weeks. I am looking for good principles to start early so that we will eventually be able to have meal times that look like the video above. I want to start good habits early. Any advice? Hi! I haven’t started trying this with my 13 month old fraternal twin girls. While I am seeing some great benefits compared to the high chairs, I am struggling with keeping them from trying to eat and then getting up while chewing. I have tried taking their food away (still learning how to be more firm about this) and telling them if they don’t sit down they must be “all done”. Sometimes one twin is simply more hungry or willing to stay seating to eat, while the other one gets up to leave and her food is taken away. When this happens the twin that has left the eating area will run back to us and try and continue eating off the other twins food. I try and block her and say sit down but I feel this is confusing them. I feel like they don’t understand why one child gets to continue to eat (because they have remained sitting) and they do not. I don’t mind them continuing to eat but it does’t help the rule of “once you get up and leave you must be finished eating”. I know 14 months is young but the high chair food throwing and cup throwing was getting pretty annoying. Any tips? Hi. I agree wholeheartedly with everything but how do we have family dinners when their on their own underneath us? It seems a bit disconnected to have them eat at a lower level than us and we love family meal times. Any ideas? Thanks! Hi Janet! We have a 8 month old baby who just started sitting on his own, so we’re excited to try this! I read through all the comments already and didn’t see this asked yet. What is the sheet that is used to cover the floor? It looks like a bed sheet, but it doesn’t seem to be slipping around. We have wood floors, so a bed sheet seems like it would be a slip hazard for baby. Along those lines, what mat/sheet is used on the floors in the RIE classrooms?